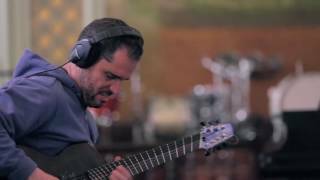 As a young guitarist growing up in the San Francisco Bay Area, Charlie Hunter was looking for a way to stand out in the '80s. His primary influences were jazz great Joe Pass and the fluid Tuck Andress (of the guitar/vocal duo Tuck & Patti), both six-string guitarists who were adept at blending bass notes into their standard guitar melodies to make themselves sound like two musicians at once. But Hunter wanted to take it one step further and set out to find an instrument on which he could simultaneously function as both a guitarist and a bassist. For his self-titled 1993 debut CD, Hunter played a seven-string guitar for the duality effect, locking down the bottom with drummer Jay Lane and mixing melodically with saxophonist David Ellis. But on his trio's 1995 sophomore release, Bing, Bing, Bing!, Hunter unveiled his custom-made Novax eight-string, the guitar that finally allowed him to realize his capacity. Designed by Ralph Novak, the instrument featured special frets and separate signals for its guitar and bass portions. Picking bass notes with his right thumb while fretting them with his left index finger (while at the same time fingerpicking guitar chords and single notes with his right hand's remaining four digits as he frets with his left hand's other three fingers), Hunter achieves the real sound of two-for-one. Hunter played with the side group T.J. Kirk in the mid-'90s, a band that derived their name from the cover material they exclusively played: Thelonious Monk, James Brown, andRahsaan Roland Kirk. Initially wanting to call themselves James T. Kirk before being threatened by the Star Trek TV and film series, T.J. Kirk released a self-titled 1995 debut and the 1996 follow-up, If Four Was One, before disbanding.Hunter took drummer Scott Amendola with him for his next project, an ambitious instrumental remake of Bob Marley'sNatty Dread album in its entirety. Also featuring saxophonistsKenny Brooks and Calder Spanier, the 1997 release beat the odds by becoming what is arguably Hunter's best album. After Spanier died from injuries sustained from being hit by a car, Hunter moved east to New York, taking Amendola with him. Teaming with vibraphonist Stefon Harris and percussionist John Santos, Charlie Hunter & Pound for Pound's 1998 CD Return of the Candyman is dedicated to Spanier. A departure from Natty Dread, mainly due to the work of Harris, the disc featured a vibes-heavy cover of Steve Miller's "Fly Like an Eagle." Hunter's modus operandi had now become shifting personnel changes, and in between tours he recorded a 1999 duo CD with drummer/percussionist Leon Parker and a self-titled 2000 CD that featured Parker and an otherwise ensemble cast. Hunter also contributed greatly to the 2000 comeback CD by drummer Mike Clark, Actual Proof.Hunter concluded his run at Blue Note with 2001's Songs from the Analog Playground, which saw him collaborating with vocalists for the first time, ranging from labelmatesNorah Jones and Kurt Elling to Mos Def. 2003 foundHunter with a new label (Ropeadope) and two new bands (the Charlie Hunter Quintet) on Right Now Move, and the beginning of Groundtruther, a partnership with percussionist/composer Bobby Previte. They released Come in Red Dog, This Is Tango Leaderbefore adopting the Groundtruther moniker. For 2003's Friends Seen and Unseen, it was back to the Charlie Hunter Trio, with drummer Derrek Phillips and saxman John Ellis, both members of the Quintet. By now, Groundtruther had taken on a life of its own, with Hunter and Previte joined by a rotating third member. Latitude was first, in 2004 with saxophonist Greg Osby, followed by Longitudewith DJ Logic in 2005. In 2006, the Charlie Hunter Trio resurfaced withCopperopolis and almost immediately announced that it was disbanding as Ellis wanted to further pursue a solo career. What to do? Form another trio! After recruiting Erik Deutschon keys and Simon Lott on drums, they released Mistico in the summer of 2007, Hunter's one and only album for Fantasy. He began self-releasing his music in 2008 withBaboon Strengthby his trio, and followed it in 2010 with Gentlemen, I Neglected to Inform You You Will Not Be Getting Paid, featuring a band that swapped keyboards for a three-piece horn section. Ever restless, Hunter collaborated on a series of duet albums over the next few years. The first two, in 2012 and 2013, were reunions with drummer Amendola and titled, respectively, Not Getting Behind Is the New Getting Aheadand Pucker. The sounds the pair engaged ranged from soul jazz to blues and funk. On 2014's Dionne Dionne, he worked with former Arrested Development guitarist Dionne Farris on a series of cover songs associated with Dionne Warwick. Hunter reassembled his Trio in 2015 with drummer Previte and trombonist Curtis Fowlkes (who was a member of Right Now Move). They issued a preview track, "Those People," in May. The album Let the Bells Ring On followed a month later. 8 Who Put You Behind The Wheel? 10 The Guys. Get. Shirts.